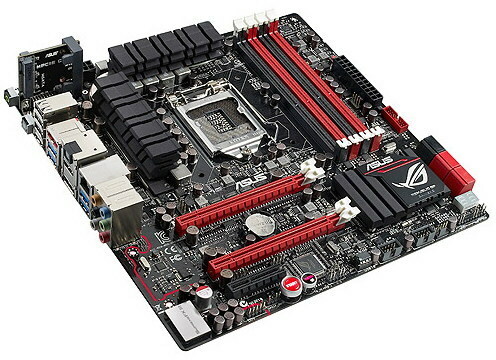 ASUS' ROG (Republic of Gamers) division has launched its Maximus V Series motherboards with the Maximus V GENE. This micro-ATX board is built with Intel's newest Z77 chipset, which supports Intel's latest 22nm LGA1155 processors. LGA 1155 include the 2nd Gen. Intel processors like [blank]'s favorite, the i5-2500K. It also features full PCI-Express Gen-3 comparabilities with Intel's 3rd Generation processor. The Republic of Gamers team equipped this board with exclusive features from the ROG team such as the Extreme Engine DIGI+ II power control design, supremeFX gaming audio, Intel Ethernet with ROG Gamefirst software and the newly added mPCIe Combo card. The mPCIe Combo card from the ROG team allows a larger amount of add ons to be added while freeing up space. The mPCIe Combo card combines both a mPCIe and a mSATA onto a single card. This allows the user to add a mSATA SSD for hard drive cacheing with Intel's Smart Response Technology (SRT). 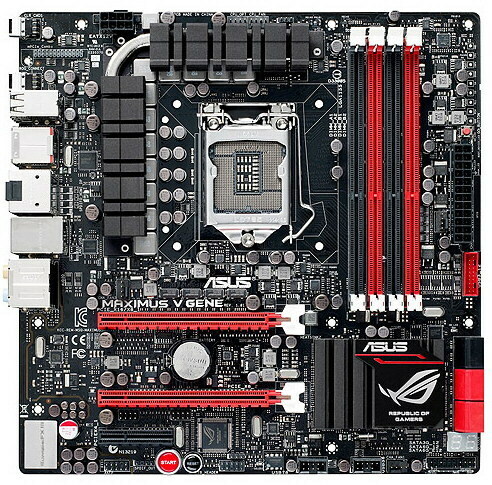 This frees up more SATA ports on the motherboard for other uses. On the other side of the mPCIe Combo card would be a mPCIe slot, this allows upgrades such as WiFi Bluetooth, 3G/4G GPS and other connectivity. ASUS' SupremeFX III Gaming Audio is designed to bring gamers the best possible integrated audio. The SupremeFX III sound is separated from the PCB, identified by its "redline" adjoining the main GENE motherboard. The shielding around the SupremeFX maximizes the audio quality by further isolating the audio processing from EMI, encasing the chipset under an aluminium cap. This combined with a large 1500uF buffer capacitor to provide sufficient energy to even the largerst sounds, SupremeFX III is capable of getting lossless audio of up to 110dB SNR. 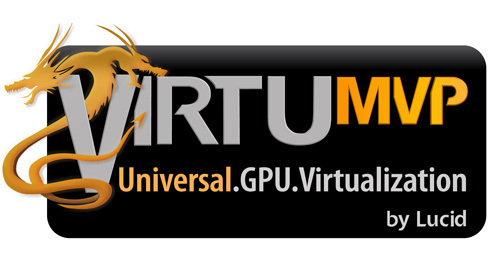 Intel Ethernet and ROG GameFirst software combines up to 35% saving in CPU usage with network traffic prioritizing, while LucidLogix Virtu MVP support enables new hybrid graphics mode that boosts overall GPU performance by up to 60%.